Provide quiet working spaces alongside collaborative spaces. Support the use of silencer headphones and the option of listening to music. Slide-based presentation tools can provide students with a framework for sharing thinking. Each slide can be dedicated to a new idea or element of an assignment. 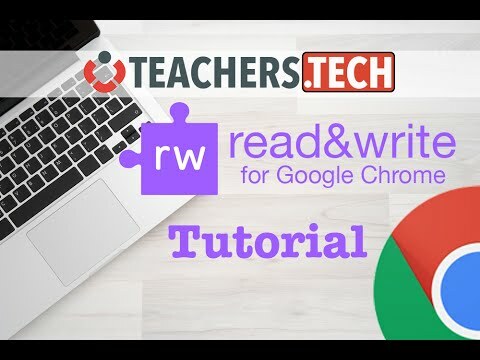 This video shows all the features of Read & Write for Google, specifically using it for Google Docs. Use jigsaw learning combined with structured teaching strategies to plan for individual needs within a group work situation. Allocate the student an appropriate task within the group and provide visual information to enable him/her to take part. This approach enables the student to concentrate upon one specific part of an overall group task, reducing distraction and removing superfluous information, which may overload a student who has difficulty retaining the detail required for addressing the whole activity. This can increase meaning and reduce the anxieties pupils with ASD experience when learning within a social context. Discuss with students what support they need to demonstrate their understanding in assessments. Identify possible barriers in the physical environment, for example: unfamiliar layout of room, lighting, temperature. Identify possible barriers in the resources and materials, for example: cluttered presentation, hard-to-read diagrams, unclear layout, hard-copies only. Managing time allocations using visual timers and calendar tools. Approaches to managing anxiety such as mindfulness, positive self-talk, and identifying solutions to anticipated problems prior to the assessment. Approaches to maintaining concentration such as negotiating breaks. Use of digital technologies such as text-to-speech and predictive text. Pre-teaching specific assessment/exam skills, such as how to approach multiple choice questions. Identify whether a SAC application needs to be made for NCEA.